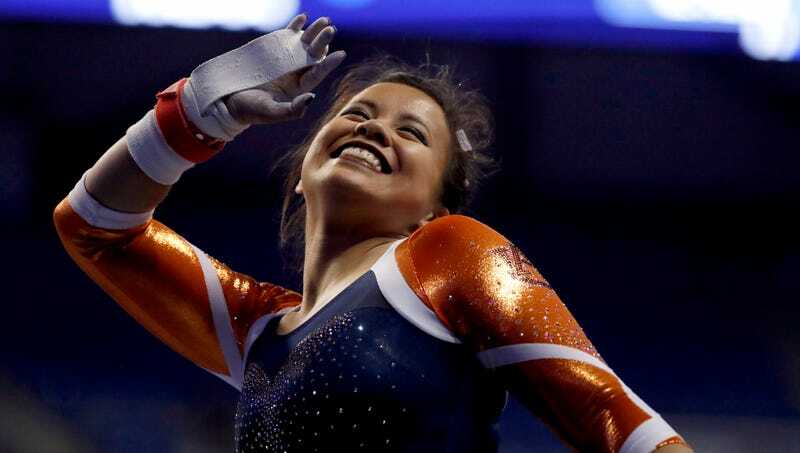 Last Friday at the NCAA Regional Semifinal in Baton Rouge, Auburn senior gymnast Samantha Cerio was just beginning her first pass on the floor exercise when disaster struck. Cerio launched into a handspring double front, a skill that requires a blind landing. However, she came in just a bit too high, and she suffered a catastrophic injury when she hit the floor. It was a really bad weekend for Auburn sports fans in general. Update (4:38 p.m. ET): Auburn gymnastics coach Jeff Graba released an update on Cerio’s injuries. She apparently avoided breaking her legs, though she still dislocated both knees and tore multiple ligaments in both knees. We have changed our headline to reflect Graba’s update. Why Can&apos;t the &apos;Liberal Media&apos; Get Chelsea Manning&apos;s Name and Pronouns Right?